I loved The Historian, so when I found out that Elizabeth Kostova's next book was soon to be released, I went into complete covet mode. 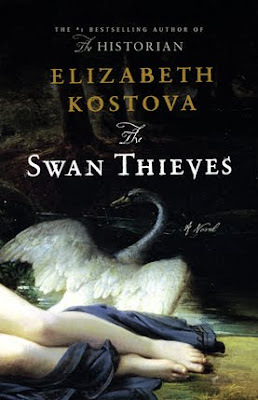 The Swan Thieves is easily my most anticipated book of 2010. The figure of Oliver towers god-like in the book, enigmatic and mysterious, known only to the reader through the narratives of the women who have loved him and Marlowe's observations. His talent makes him seem like the Zeus of the story, and his muse, a mysterious, beautiful dark-haired woman he keeps drawing and painting - but whom he has never met. The other main story is that of this dark-haired woman with whom Oliver is obsessed; she is Beatrice de Cherval, who lived in France during the time of the Impressionists. An artist of prodigious talent herself, she abruptly stopped painting without explanation. This mystery, as well as that of her doomed love affair, is unraveled slowly and tantalizingly over the course of the book. I read this, and her first one, the Historian! I like this author, I read every book of her!